The long-term clinical studies conducted in the leading medical centers have confirmed that NEOPROST® is effective due to its unique ingredients and carefully tailored dosage. The African plum extract extract displays anti-inflammatory properties and normalizes the urinary system functioning: relieves frequent urination, incomplete emptying of the bladder; stimulates hormonal system functioning, reduces prostate tissues overgrowth and preserves its functioning. The common nettle root extract has anti-inflammatory, antiproliferative and immunomodulatory properties. Studies show that the common nettle root extract combined with African plum bark extract has demonstrated higher efficacy as compared to monotherapy. The celery seeds extract exerts anti-inflammatory and diuretic properties, normalizes the neuroendocrine function of the prostate, prevents prostate tissues overgrowth and has an antioxidant effect. Purple coneflower boosts the immune system and improves male stamina. Pot marigold has antibacterial and anti-inflammatory effects, improves the secretory function of the prostate. NUTRITIONAL AND ENERGY VALUE (CALORIC VALUE) PER 100 g OF THE SUPPLEMENT: protein – 15.0 g, carbohydrates – 1.1 g, fat – 0 g; 269.4 kJ / 64.4 kcal. 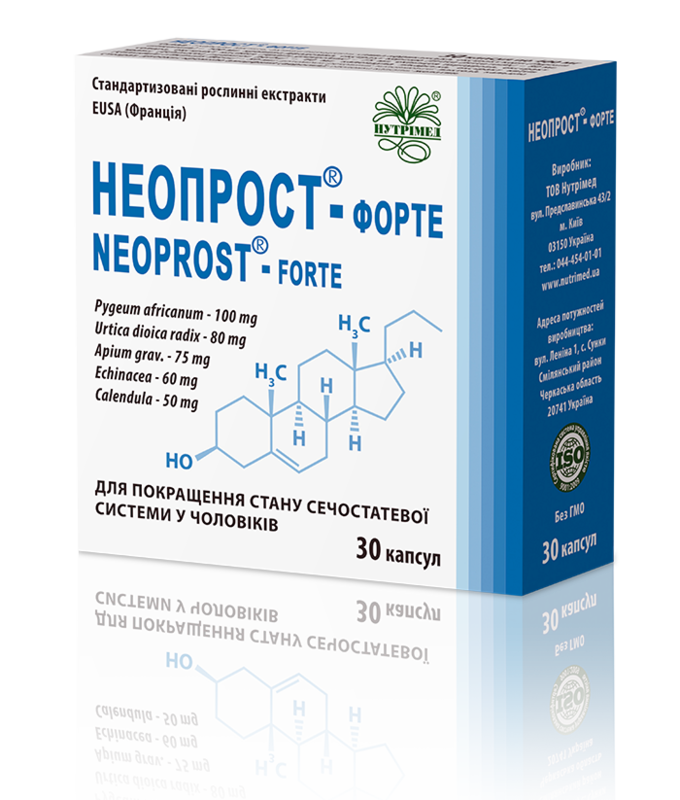 RECOMMENDATIONS FOR USE: NEOPROST®-FORTE is recommended as an additional source of saponins, phytosterols and other biologically active substances to improve the functional status of the genitourinary system in men; it reduces prostate inflammation in prostatitis, eases urination, improves general health and the quality of life in men with benign prostatic hyperplasia by normalizing its volume as a result of hyperproliferation suppression. METHOD OF ADMINISTRATION AND RECOMMENDED DAILY DOSE: adults (men) should take 1 capsule 1-2 times daily after meals swallowed with plenty of drinking water. The treatment course is 2-3 months. The course can be repeated if needed. CONTRAINDICATIONS: individual intolerance of the ingredients. Publication (in Ukrainian): ИСПОЛЬЗОВАНИЕ ДОСТИЖЕНИЙ СОВРЕМЕННОЙ ФИТОТЕРАПИИ В АНДРОЛОГИЧЕСКОЙ ПРАКТИКЕ. Гурженко Ю.